Top Floor unit. (2 flights up - 16 steps) Queen bed in master, two Twin beds in second bedroom, King bed and Twin bed in third bedroom (loft), and a queen size sofa sleeper. 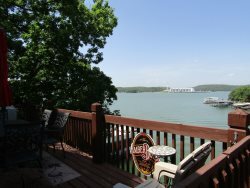 Includes full kitchen, TV/DVD/cable, stereo, and gas grill on the lakeside balcony. Complex offers Pool, kids pool, and swim dock. Pelican Bay is just off Highway KK near lake mm 26, it is nestled in a quiet fun resort. You are only 1 mile from 2 great golf courses and minutes from the Osage Premium Outlet Mall, Main Street Music Hall, and lots of great dining options. Great views of the main channel, Tan-Tar-A Resort's fireworks, and one of the few islands on the Lake. This resort is one of the few at the Lakes located on mostly level terrain.